As of yesterday I am officially two months out from my Roux-en-Y Gastric Bypass surgery. It's been a whirlwind of activity, emotions, and food. I wish I had made an update post a month ago because now it seems like there's almost TOO much to catch up on. So, to avoid getting off topic I'll try to keep things in chronological order. Sorry if this ends up being a long read! A few weeks before my surgery I became very active on a wonderful weight loss surgery site, ObesityHelp.com. The forums there are quite active and have a wide range of people posting. Everyone from pre-ops to people who had the surgery upwards of ten years ago. I'm not entirely sure what I would have done without the enlightened help of all those wonderful people. I learned more from them then I did from my surgeon. Because of them, I went into surgery on the morning of March 8th without even a bit of fear. I was more anxious to get it over with. Mike, on the other hand, was a different matter. He was afraid for both of us. I went into surgery a few hours late and was in there for over four hours (because they were removing my horrible gall bladder as well.) That anesthesia really packs a punch. I remember them wheeling me in to the operating room and I remember moving myself over to the table, and then everything else is totally blank. There's at least twenty minutes of memory loss there because I don't even remember my surgeon talking to me beforehand like he says he did. I woke up in recovery feeling a bit flattened and incredibly thirsty but otherwise totally fine. My hospital stay was fairly uneventful until the day that I left. I spent most of my time in bed, drifting in and out of sleep, and getting up every few hours to walk laps around the nurse's station (really embarrassing when you still have a catheter in). I didn't get anything at all to drink until the next day after they did a viewing to make sure there were no internal leaks. After that, I was allowed juice, jello, and broth. I went in to the hospital on a Tuesday morning and was cleared to leave Thursday early afternoon. The attending nurse thought I was doing so well walking around my hospital floor that I should be able to just walk right out without a wheel chair. Unfortunately the ward I was in was on the opposite side of this very LARGE hospital campus from where you can pull the cars up. So I shuffled through the hospital clutching my stomach and by the time I got to the pharmacy I was in a lot of pain. The nurse had called in my prescriptions hours before and they were supposed to be ready but I ended up having to stand around and wait for 45 minutes before they were actually filled. By the time I got into the car, I was in so much pain that I downed both my pain meds and thought I was going to die. We almost didn't make it home. I almost had to have Mike turn around and take me right back to the hospital. But, I made it, crawled up the stairs to bed, and passed out for the rest of the day. One of the prescriptions the hospital gave me were for stool softeners because pain medication can make you constipated. Apparently they weren't supposed to give me those because they were too large. By Saturday morning I was back in the emergency room with severe dehydration because of a pill getting stuck in my pouch. I couldn't even keep my pain medication down. So, I was miserable, sick, and in a lot of pain. After a short ER stay, I felt much better and was able to get on with my first post-op week. Exactly one week after my surgery my mother to Seattle via train with all seven of my siblings plus my 17 year old sister's new born baby and my 15 year old sister's boyfriend. They arrived at midnight with no money, no place to stay, and enough baggage for an army. It took both Mike and I in both of our cars two trips to get everything to our house. I then had to spend two days off of my pain meds driving my mother around desperately looking for a shelter to take them in. While we did find one, the next few weeks were really hard on me. I was driving her around to food banks, welfare offices, or other organizations almost every day. I was unable to take any of my pain medication while driving, of course. Besides dealing with my mother, I was having to deal with a diet that shifted from pure liquids to 'soft foods'. Every meal was an experiment on whether something would get stuck or make me sick. I quickly became afraid to eat anything at all and had to make myself eat on a schedule. My body was still quite sore, especially my left side, and I had to spend the first few weeks sleeping on my back. I'd usually wake up after about 4 hours of sleep and have to take more Oxycodone. I also required a long nap every afternoon. Through it all, I was struggling to walk every day. I was told that this was vital to my recovery. It rains so much here in Seattle so I'd often do laps around the mall or Costco. I was always exhausted after them. Also, ten days after my surgery I attended a 2 day groom show to watch while my friend, Deb, competed with Caly. I was so tired and my mood kept fluctuating. I found myself getting irritable and grouchy really easily. This was right when I was starting 'soft foods' and I had my first experience with something getting stuck during a public dinner. Ugh! I had my first experience with 'dumping syndrome' at PF Chang's. Apparently they put brown sugar in the sauce of the chicken lettuce wrap filling. I've never felt more sick or miserable in my life. I was shaking and my heart was beating too fast. I kept getting hot and cold flashes and felt incredibly nauseous. I've been MUCH more careful since then and haven't experienced this since. At five weeks out I was progressing to even more solid foods but I was having problems eating at all. I felt nauseous ALL the time. It'd even wake me up while I was sleeping. I finally called my surgeon and (after making me take two pregnancy tests) he prescribed me Zofran. My whole post-op world turned around then! I felt wonderful and, more importantly, human again! I went to California for a week to visit my grandmother and had very little problems eating out at restaurants the entire time. At this point I was still having a few problems eating my first meal in the mornings. My stomach would get so uncomfortable at night that I'd wake up feeling sore and sick. By six weeks out all pain was gone and I started working out with my personal trainer again. I found myself much weaker then I was pre-op and that frustrated me. I pushed myself too hard initially and paid for it with sore muscles for days afterwards. But it seemed like working out helped my recovery even more. My energy level was through the roof and I was eating much closer to the calorie amount that I was needing. 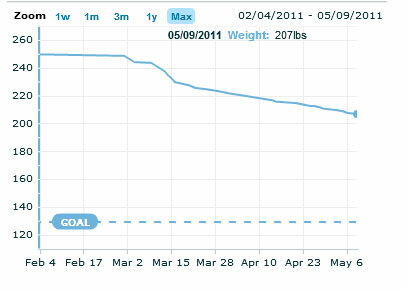 I started tracking my food consumption on MyFitnessPal.com and found out that I was WAY below the nutrition I needed. I continue to track my food, exercise and water intake daily. Once I upped my calorie and protein intake my weight loss started speeding up. This is a fabulous tool that I recommend to everyone! On May 3rd I started back up at work. I definitely made a mistake by not weaning myself back in to the process. I went back in full time with a full schedule. By the third day I was ready to throw in the towel, walk out, and never come back. Every day I was exhausted and I'd have to go to bed two hours earlier then I usually did. Besides work, I was still going to my personal trainer twice a week as well as yoga on Thursdays. This weekend has been a much needed recovery period and I'm rather dreading starting work again tomorrow. I believe my schedule will be quite a bit easier but I know the exhaustion will still set in. Everyone tells me that I should cut down how many dogs I'm doing but that's just impossible currently. I can't force that many clients to reschedule for weeks later after they've already waited two months for me. I'm also finding it hard to eat on work days. For some reason, even when I stop myself to take a lunch, I can't seem to get much in. I ordered a wonderful bento box style lunch box off of Amazon.com and I'm hoping to use it to take softer, easier food to get down. Oh! And as of today I've lost 48 pounds. I look in the mirror and I can certainly seem the difference. I can't say I feel the difference, though. 50 pounds is more then Caly weighs but I don't feel gravity pushing me down any less. My clothes fit awkwardly but they still fit. I can't wait to see MORE of a difference. I really want to lose at least 10 more pounds by my birthday on June 16th. I seem to be averaging a little over 10 pounds a month so I hope that keeps up. Wish me luck!